Building a duck blind is only half the battle, now you have to brush it up. Camouflaging a duck blind so it blends in to its surroundings isn’t difficult, but there are a few things you should consider before you start cutting limbs and hauling in cane. Ducks and geese circling your spread are looking for anything and everything that looks suspicious and could pose a threat. With the potential of hundreds of eyes on your blind at any one time, the odds of detection go up substantially. This is why camouflaging your blind is so important and the best decoys, shotgun patterning, or calling mean nothing without it. Here are some things you should consider to make your duck blind or goose pit invisible to waterfowl. Attaching brush to a duck blind should be more thought-out than just cutting green vegetation and hauling it to your duck blind. The first rule of blind concealment is to use your surroundings and the natural vegetation within it to brush your blind. Natural vegetation growing near the blind should always be your first choice. If you’re hunting flooded timber, you wouldn’t want to bring in cattails and vise a versa. Choosing natural vegetation will ensure your blind melts into the landscape. Using this method, even the largest duck blinds can be camouflaged to the point even other hunters won’t notice them. Having a well-hidden duck blind increases success rates and can coax skittish ducks well into killing range. The best duck blinds totally blend into natural cover. Anytime you camouflage a blind, your goal should be to cover it so that it can’t be seen. Anything less and you’ll be starting at a disadvantage come opening day. Box blinds are the most popular design for ducks, but that doesn’t mean you have to use them. Thinking outside the box, and creating a blind that fits your situation may be better. One tactic that works well is to use small clumps of trees at the edge of the shooting hole and hide between them. These types of blinds are easier to construct than box blinds and offer a more natural look, especially on exposed mud flats or lake shorelines where the water has receded due to drought. Judging the distance of ducks is a lot easier when you can get them close, and a well camouflaged blind is the first step towards making it happen. Oak trees tend to offer the best foundation for blinds made of the limbs and tend to hold their leaves throughout the winter. Blind construction typically involves driving 4 or more steel t-posts into the mud where you plan to hunt and in the shape you want the blind to be. The T-posts will give the blind the structural integrity to stack limbs against. A 5-foot section of chain link fence can be laid on the mud to serve as the floor for the blind. Once your main blind is complete, erect smaller clumps of limbs nearby for a more natural look. Your larger main blind will blend in even better and the ducks won’t suspect a thing. 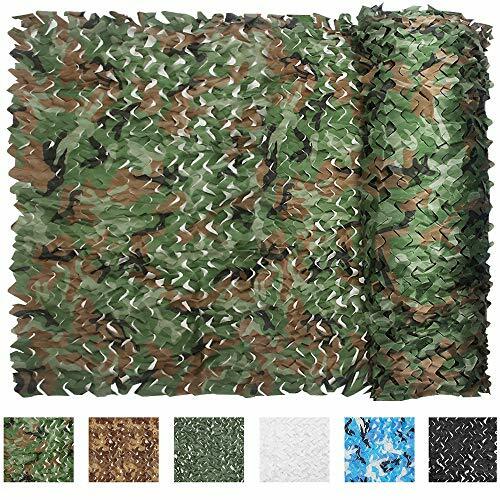 Another tip that works well for brushing duck blinds is to develop several layers of alternating camouflage patterns that break up straight lines. This includes using different types of brush in a patchwork type pattern. Using vegetation of several different colors and styles (i.e. grasses, shrubs, and tree limbs) will help give your duck blind a more natural look and blend in better than just using one plant species such as cornstalks or cane for the entire blind. Vegetation should also be placed thicker around shooting holes or wherever hunters will be sitting to help hide movement and faces. A mix of light and dark vegetation will help conceal shadows. Natural vegetation around the blind should be left standing and any vegetation cut to help brush your blind should be taken from further away. 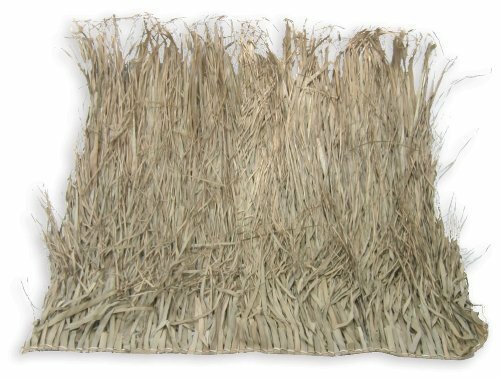 This tactic ensures that every reed, cane, or limb near your blind will still be intact and help you blend in even more. Camouflage Netting can also help to with patchwork blind setups. Cable ties are the best way to secure brush to a duck blind. Not only are they strong, but they are quick to apply as well. Cable ties can be found cheap in most automotive and variety stores. Cable ties that are 12 inches or longer work the best, and brown or black colors tend to blend in really well. Once your blind is encased in hog-wire, vegetation such as clumps of grass, limbs, and reeds can be secured using the cable ties. Simply hold the piece of brush to the hog-paneling or chicken wire and wrap a cable around it tightly. Multiple cable ties can be used to secure large pieces of brush and they don’t produce glare or give off a shine that could alert weary dabbling ducks. Cable ties will last all season long and usually longer than the brush or blind itself. Use cable ties while brushing your blinds to make attaching brush quicker and easier. The general trend with building duck blinds seems to be taller and larger. While larger blinds aren’t necessarily a problem, taller blinds that stick out on flat landscapes can do more harm than good. Small river ducks are especially hard to hunt and staying low profile on a river bank is usually the answer to getting them to decoy. If you’ve ever scouted by plane, you know it’s easy to pick out duck blinds in fields and ponds. They stick out like a sore thumb and look like a boxed eyesore. Ducks can see the same thing we do, so while you can kill ducks with these exposed box blinds, switching to a lower profile and less visible blind will no doubt increase your success rate. When constructing a new duck blind, don’t exceed the height of the natural vegetation around it. If the vegetation is really short already, consider using layout blinds or constructing a pit blind. If you’ve ever wondered what that patch of tall reeds is doing growing there by itself with no others within eyesight, it’s likely that another duck hunter planted it around their blind and it took off. Invasive species of cane are notorious for being brought in to brush duck blinds and then overtaking an area. One of the most prolific species of reeds that hunters use to brush duck blinds with is Giant Reed (Arundo donax). Giant reed can grow over 10 feet tall and creates dense stands that can conceal even the largest duck blind. The problem is that this reed spreads rapidly to the point it’s difficult to control and it offers very little value to wildlife. Avoid introducing invasive species to the areas you’ll be hunting. The best tactic is to use vegetation that is immediately around the area you plant to hunt. Not only will your blind blend in better, but your hunting won’t be affected by introducing a species that takes over your best duck hole. For tips on what duck food grows naturally where you hunt or species to plant to attract ducks, check out our recommendations here. As the season changes, so does the pigment in leaves and brush that are used to conceal duck blinds. The dark greens that may work early in the season will not blend in very well as everything starts to die off. Additionally, brush that was cut for early teal season may already be dead and brown by opening day of regular duck when green vegetation is still dominant. Paying attention to the different color variations and changing seasons will help your blind blend in when it matters the most. Brushing your blind should be a season long affair. New vegetation should be added regularly to replace damaged or thinning areas of the blind. This constant upkeep will ensure you have several color variations of the natural vegetation in the area and never have to worry about sticking out like a sore thumb. Camouflaging a duck blind is an annual event that isn’t vey glamourous, but may be the most important building block to a successful season. Constructing a duck blind that not only is structurally sound, but blends into the natural environment around it can mean the difference between a freezer full of duck meat or one that’s empty. The best tip for brushing a duck blind is to use natural vegetation that can be found within 50 feet of the blind. Bringing in your own brushing material should be avoided, unless it’s just for a base coat. The best concealed duck blinds look so natural that you can’t even see them. When brushing your blind, use as many different types of plant species as you can. This adds depth and helps break up shadows. Avoid brushing your blind with only one type of vegetation unless that’s the only thing around. Cables ties are the quickest and cheapest way to attach brush to hog paneling. Avoid hauling in invasive species and reeds that can take hold and ruin your hunting area. Plan for color variations as plants begin to die and wilt. Continuously add brush to your duck blind all season to patch up weather damaged areas and thinning spots. Use these tips while brushing your duck blinds next season and the ducks will never know you’re there until it’s too late! Interested in a new action camera to film your duck hunts? Check out our top picks here.